Hilarious sense of humor spices up family life. As kids grow into preteens and teens, sharing jokes and puns ultimately brightens their life as their sense of what’s funny becomes a little more sophisticated. A mere sense of humor comes with a whole lot of benefits to kids. Laughing together with the kids is a perfect way to connect and relate. The amazing thing about an excellent sense of humor is that it makes kids smarter and healthier. Some people may tend to think that humor holds as part of our genetic make-up. This is not true, since a sense of humor is a learned quality that can be developed in kids as they grow and it is not something that they are born with. How Can Jokes Help with Kids’ Development? Since humor is something funny, a good sense of humor can be an amazing element that kids can rely on all through their growth and development. It enables them to be spontaneous, see things in many different perspectives and clasp unconventional concepts. The kids whom have developed with a good sense of humor seem to be happier and optimistic as well. These kids have learned to not take themselves too seriously. In that way, they have enhanced their self-esteem with the ability to handle their differences with others. 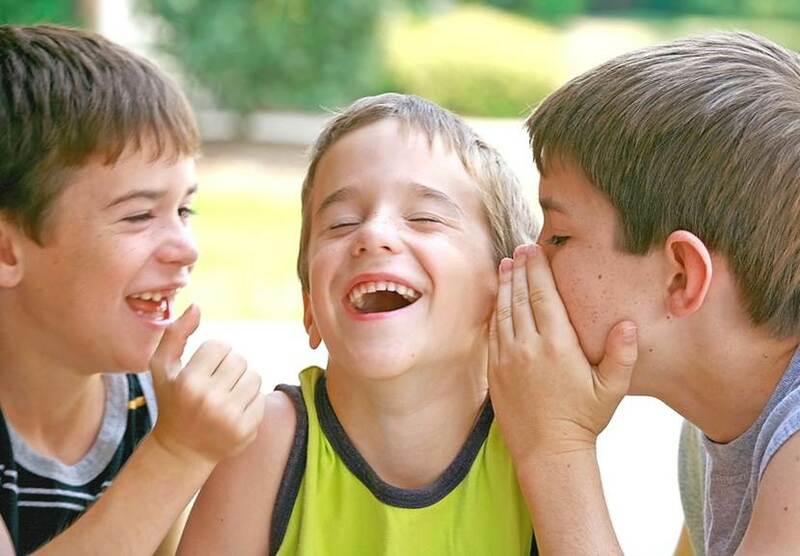 It is quite evident that kids who are able to share their sense of humor with others are liked more by their peers. They are capable of handling their childhood adversities more efficiently. A good sense of humor applies to the social and emotional development of kids. Researches have indicated that people who laugh more are healthier. These people are less likely to be depressed; they also develop resistance to physical problems or illness. A sense of humor develops in kids at a very tender age. As kids grow, their sense of humor varies and what could be funny to a toddler may not seem funny to a teen. Thus, it is important to know which sense of humor suits your kid as he/she develops. Here we listed best kids' jokes for different ages. As for babies the best kids' jokes can be a litter different. Babies may not understand humor, but they will see and know when you are smiling. Babies recognize funny noises and facial expressions when you are smiling or laughing. They will sense it and try to imitate you. Good thing about babies is that they are very sensitive to stimuli such as tickling or raspberries. Sometimes babies between the ages of 9 to 15 months are old enough to recognize it when their mother’s puts the diaper on her head or makes a quacking sound like a duck. They know it is something unexpected and that brightens up the baby, since it’s funny. For toddlers, the best kids' jokes also have its own features.The toddlers are more amazed with physical sense of humor especially the surprise element such as unexpected tickle or peek-a-boo. As kids develop, rhymes and nonsense words seem to be funny and this fact goes up to the preschool level. At this stage, they find courage to amuse their parents. They achieve this by trying to be funny. For instance, they are putting on the parents shoes and clomping around the house or pointing out the wrong facial feature when asked. For a preschooler, a good sense of humor is more likely to be found on a picture. The picture could be something whack like a pig wearing sunglasses or a car with square wheels. To preschoolers, this is funnier than a joke or pun. For this age, group incongruity that is seen in pictures and sounds is an ultimate sense of humor. And as they grow, they become more delighted with bathroom humor due to a better understanding of their bodily functions. During kindergarten and beyond, the kids are obsessed with basic wordplay, slapstick and exaggeration. School-age kids find it interesting and funny to tell simple jokes and will repeat the same jokes over and over. As they proceed on to older grades, they are better and well versed with words and meanings. They can as well express their jokes with word plays such as riddles, puns and others. Older grade-schoolers will start making fun of any deviation from what they perceive as normal forms of behavior. Jokes related to bodily functions are a hit to this group and at this stage the jokes are developed since they are well versed in humor. Q: How do you wake up a sleeping Lady Gaga? A: You poke her face! Q: What do you call a Frenchman on the beach? A: Philippe Flop (said with French accent). Q: What do you call a cheese that isn’t yours? Q: How do you make a goldfish age? A: Take out the “g”. A: Hide behind a tree and make carrot noises. Q: What goes 99-thump up, 99-thump up? A: A centipede with a wooden leg. Q: What do you call a famous fish? There is always a chance to develop child’s sense of humor. Babies’ smiles are delightful and it is important to keep this encouragement as babies develop. Being playful and humorous with your kid creates a hilarious attitude towards life. The best way to develop this attitude in your kid is to spend time with him/her from the toddler years to school age, while being perceptive of the opportunities your kid gives you to smile. You should be spontaneous, engaging, playful and aware of what amazes your kid at different ages. Make your own jokes that are funny to the kid. You can employ funny stories to laugh out loud and be most friendly with your kid in any circumstance. This is the best way to make your kid happy. Appreciate all the attempts of the kid as he/she tries to make a joke or a funny drawing. Praise the kid for being funny and always be open to surprise. The kids should be surrounded with funny picture books and nonsense rhymes for toddlers and preschoolers. For older kids, joke books and comics would be the choice. A major part of your interactions with the kid should be humorous, and often make sure that you encourage them to share funny observations and reactions.